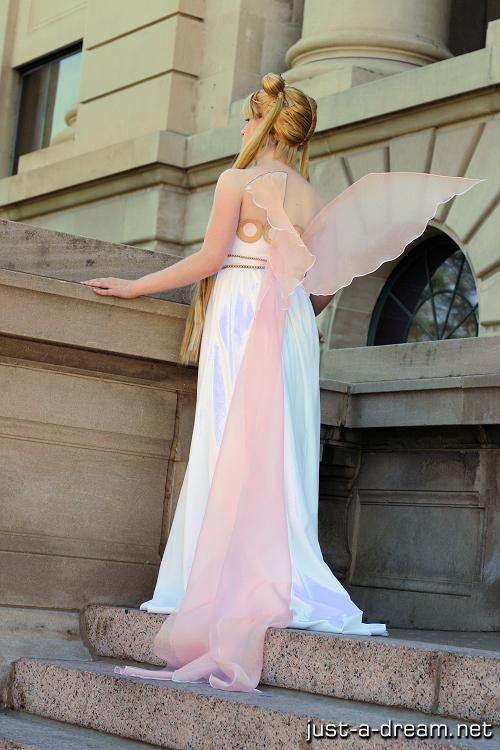 I’ve gotten several questions about the process of making the wings that I wore along with my Neo-Queen Serenity costume, so I wanted to come out with a tutorial on how to get the look. It was one of my favorites, and the wings were a super simple part of the project! They’re fun not just for this costume, but any costume that has large, floating style wings. I used the same structure for my wings that went along with Flutterina, too. Start out with designing the size and shape of wing that you want. Serenity has a sort of softly rounded traditional open wing shape, but butterfly, fairy wings, or teardrop shapes will work, too. This won’t work as well for shapes with a lot of small offshoots; all of the support is coming from the top, so a solid shape is best. Finally, take the double sided tape and run it along the length of the wire, from the base of the U to the tip (don’t cover any of the part that goes into the channels). Then, just carefully apply the very upper edge of your wings to the wire frame, slightly wrapping the top hem around the wire and tape. Insert the base into the channels and ta-da, you’re done! Your wings are fully adjustable at this point, if you want them to stick out to the sides or straight to the back, just bend your wire accordingly. For safety, apply just a little dab of hot glue to the tips to keep the sharp wire from poking anything. You can add additional touches to your wings if you like; for example, with the Flutterina wings, I used Wonder Under to add some colored spots to the butterfly style wings. Just don’t add anything too heavy! Enjoy!